A 21-year-old Somali refugee is critically ill after setting herself on fire on Nauru, a tiny South Pacific republic where Australia runs an offshore detention camp. Some in Australia are using the incident to press their criticisms of the country’s refugee policy. But the government in Canberra believes some refugee supporters are putting pressure on migrants to harm themselves for the attention it will bring. A 21-year-old Somali refugee Hodan Yasin has been transferred to a hospital in the Australian city of Brisbane where she is in a critical condition after setting herself on fire on the island of Nauru Monday. Refugee advocates say the injured woman was distressed after she was previously sent back to the South Pacific nation following medical treatment in Australia for injuries sustained in a road accident. Last week, a 23-year-old Iranian asylum seeker died after he set himself on fire at the Australian-run migrant center on Nauru. It is one of two offshore processing camps sponsored by Australia as part of a policy to stop asylum seekers reaching its northern waters by boat. Even if detainees are found to be genuine refugees, they are not allowed to resettle in Australia. Australian Greens Senator Sarah Hanson-Young says her country is abandoning vulnerable people. 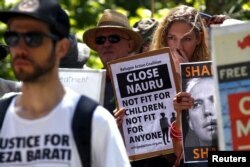 Australian Immigration Minister Peter Dutton has accused refugee supporters of enflamming tensions on Nauru by encouraging migrants to take drastic measures to try to force Australia to change its border protection policies. Asylum seekers intercepted trying to reach Australia by sea are sent to either Manus Island in Papua New Guinea or to Nauru. Officials in Canberra say the policy is a deterrent and has stopped a steady flow of migrants trying to reach Australia by boat. Last week, the Papua New Guinea government said it would close the Australian facility on Manus Island after the country’s Supreme Court ruled it illegal. A boat carrying Sri Lankan asylum seekers has reportedly arrived on the Cocos Islands, an Australian territory in the Indian Ocean. If confirmed, it would be the first refugee vessel to have reached Australian waters in almost two years.